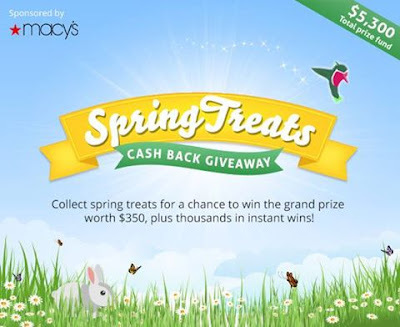 Savvy Spending: Top Cash Back: New Spring Time Treats Instant Win Game! Plus $5 Amazon gift card for new members! Top Cash Back: New Spring Time Treats Instant Win Game! Plus $5 Amazon gift card for new members! It's springtime and that means the return of the Top Cash Back Spring Treats game! Visit Top Cash Back and you may encounter little hummingbirds around the site which can contain an instant win or a "treat" to collect for bigger prizes. There's over $5,300 in prizes and if you make a purchase at one of the Buy-to-Win retailers listed on the game board during the game, you'll be automatically entered to win back up to $100 of your purchase. updated on 5/17- there are just 8 days left! You can check back and I'll update this list as new stores are added! The game runs through May 24! If you're not a member of Top Cash Back yet, GO HERE to join and get a BONUS $5 Amazon Gift Card!